My bus from Kuala Lumpur (35RM, $10CDN) only took me through to Tanah Rata, the main town in the Cameron Highlands, while my host was still 20km away in the small village of Kampung Raja. I caught a second bus for that leg, and after arriving in Kampung Raja, called my host from a payphone to pick me up. A short while later Tien Khuan arrived and took me to his home to stay with his family. My host is a former Physics lecturer turned organic farmer here in the Cameron Highlands. The first farm, only 1 acre, was started in 2002 and a 6 acre organic farm followed 4 years later. Farmable land is at a premium here in the highlands, and every bit of land that can be is used to its most. The original acre of land is used for a niche crop called pea sprout, while the newer area is organic vegetables including broccoli, cauliflower, tomatoes, cucumber, carrots, several kinds of spinach, lettuce and many more. When driving by other farm areas nearby, you can see a difference even in the look of the soil, with his looking rich and dark brown in comparison. Tien Khuan credits the use of a technique called Biodynamics created by Austrian Rudolf Steiner about 90 years ago for much of the his current success, though the process is continually being tweaked for better yields and product. Protecting the crops is important and more difficult without the convenience of just spraying a chemical on them. The clear plastic coverings you can see are to keep the rain off the crops, while the green netting is to keep the fruit flies out of the tomato, cucumber, gourd and zucchini crops. The learning process is also tough, as there are virtually no others in the area farming as he does. 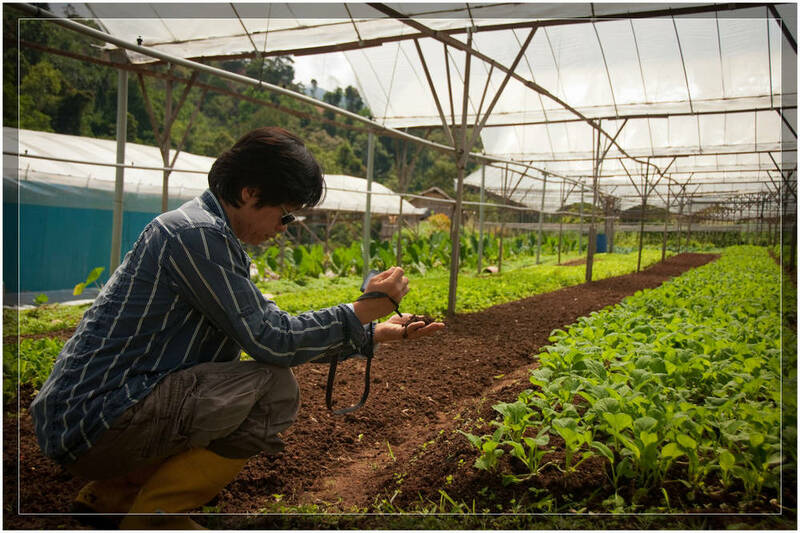 Tien Khuan has traveled to Australia on a few occasions to visit other organic farms and bring their tips and techniques back to Malaysia for use on his farm. It was just recently after several unsuccessful attempts at growing tomatoes that he found that this type of netting would keep the insects out but still allow the crops to grow. "Migrant workers in the field"
The farm is staffed by 22 mostly migrant workers from Burma & Nepal who live on site at the farm. They pick the crops and maintain the farm, while shipping approximately 40000kg most of which is actually pea sprout. I was fortunate to sample his vegetables on a several occasions, including 2 meals at a local Chinese restaurant where you can bring your own veggies and even fish to be cooked for you. We also ate spaghetti with sauce made from fresh tomatoes, and right on the farm I ate fresh cucumber and carrots picked that very second. Verdict: excellent. Organic farming in Malaysia is still in early stages but there has been interest from other local farmers in Tien Khuan’s farm and the techniques used. Like elsewhere, the vegetables sell for more than their pesticide-sprayed counterparts, but the cost is time, and in Tien Khuan’s case, 4 years of trial and error to get where he is today. It’s a work in progress.